Benjanun Sridungkaew will likely have come to most people’s attention over the last 18 months for her prolific, wonderful, non-Western-centric short fiction that has taken in virtually every subgenre there is; she has been published on Tor.com, Giganotosaurus, in Beneath Ceaseless Skies, Clarkesworld, reprinted in various year’s bests – hell, just go and check out her bibliography; and this year she was nominated for the John W. Campbell Award. 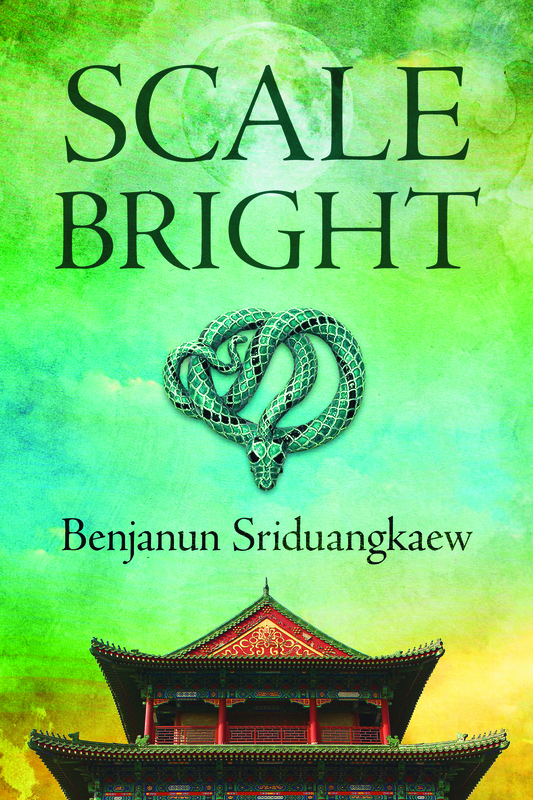 She’s finally graced the world with her first novella-length work, which I loved; so here is Benjanun Sridungkaew, on Scale-Bright! When I came across this lovely art of Bai Suzhen and Xiaoqing – the white and green snake, respectively – I had a giggle when I read the description: like me, the artist thought ‘the guy the White Snake married’ (Xu Xian, though I often have trouble remembering his name, I think we all do) was… not perhaps the most exemplary hero. In the original legend, he comes across as gullible, weak-minded, and a little boring, being prone to fainting and being deceived. He is, to be charitable, not particularly worthy of Bai Suzhen (one wonders: what is he worthy of? Hm). Which is to say, I could have told the story of the White Snake finding the reincarnation of her husband in modern Hong Kong – that would be how some writers might have done it – but, really, why would I? It doesn’t seem like much of a story, and if he failed her so badly back then it doesn’t seem likely he will be much more sensible a few reincarnations later. I would have been bored trying to whip that material into something that’d excite and interest me. Maybe she could look for her son, who would presumably have been born half-demon? That has a bit more promise, but it’s still not quite right. It’s lacking something. Fun. Excitement. When I write, I want the story to excite me first. But I really liked the White Snake legend. What was one to do? By that point I had already written the stories collected in The Archer Who Shot Down Suns, centered around the archer Houyi and her wife Chang’e. And I wanted to do more with those characters – and so tying them all into the same thing emerged as the likeliest choice. I would get to continue the thread I built up through those three short stories, and play with another favorite myth at once – and I really like efficiency! The best part is that I didn’t have to change anything about the original – with Houyi I made a particular, significant deviation from the source material, but here I built on what is already there. The legend of the White Snake already centers on two women bound as sworn sisters, who do all the things – having adventures, fighting, knowing what they want and going for it against all odds. What I am taking a long, long way about to saying is that I think it matters what stories we choose to tell, the direction of narrative we take. Ana Grilo, reviewing Scale-Bright, says that the mythical story threads are ‘important in their reshaping the imagining of the world from a very feminine point of view’ – and I was so delighted to see that, it’s definitely one of the objectives I set out to accomplish. Yes, I could have woven the story around Bai Suzhen searching for her son, her husband, or both; another writer might even have made a reincarnation of Xu Xian or her son the lead of the book – or kept Houyi’s gender from the legends, brought ‘him’ into modern Hong Kong as a wuxia hero in leather jackets. Those could have been good stories, I imagine, but they are not the ones I chose. I’m faithful to old legends that I love, but I don’t think we should be totally shackled to them. Storytellers get to modify, leave out, expand. In my book, Houyi is a woman. She has a wife and wears dapper, and loosely follows an internal code similar to that of wuxia heroes. Chang’e is not a frivolous ditz (as some of the variants portray her); she is an equal partner to her wife, as capable as Houyi and striving as hard to be an aunt to their niece Julienne. Xiaoqing is notorious for having seduced peasant girls in ancient China, and the demon’s realm is populated by beings who are unfettered in romance. The various story threads in the novella are held together by a depressed young woman, who gets to have adventures and find herself worthy of herself. These narrative choices don’t come out of nowhere. Whom we choose to center is as important as whom (or what) we leave out. We make the choices of whether face-punching occurs in the stories we tell, or whether the shoes we make are comfortable for everyone to wear and don’t flood the waters with weird, awful chemicals. And personally, I feel much more comfortable not going around punching people in the face or pumping toxic waste into the waters. Hooray for nice, clean waters! By Intellectus_Speculativus in Essay, Guest Post, Queering the Genre on September 10, 2014 .